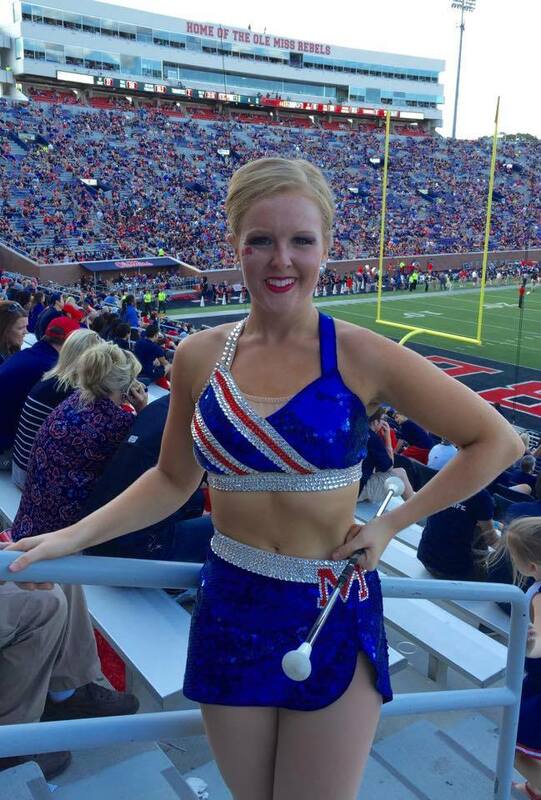 Today we are headed down south to meet Haley Shiver, one of the feature twirlers for the Ole Miss Pride of the South! Haley is a junior studying Integrated Marketing Communications. I started going to Harry Brown’s Twirling Camp when I was six years old. I always looked up to the big girls who were practicing their college routines. I wanted to be just like them. 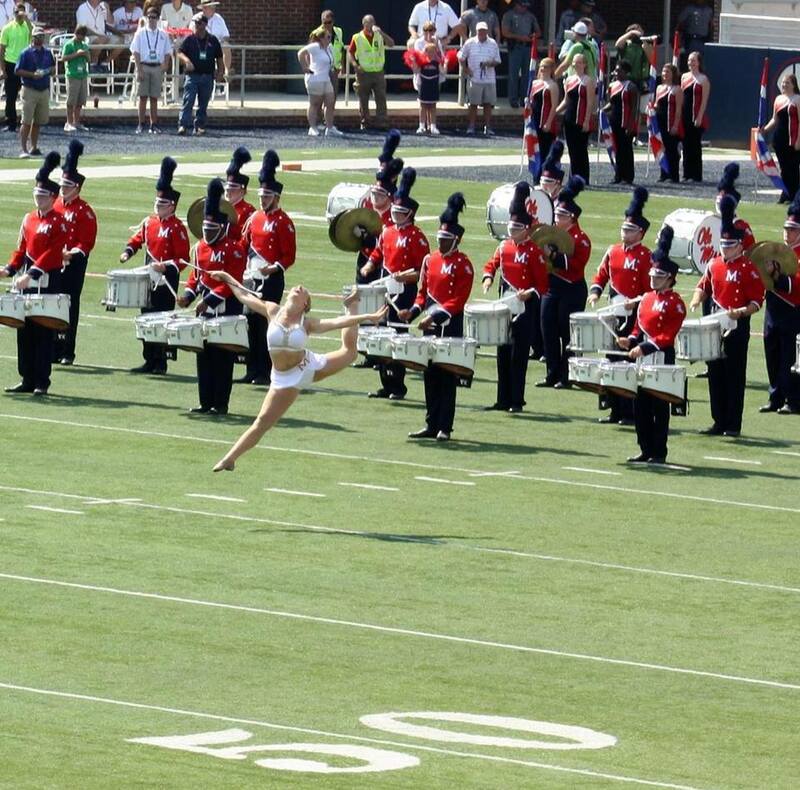 Also my high school didn't allow twirlers, so I unfortunately never had the opportunity to perform at high school football games. Instead I performed at soccer games, and various events and loved performing so I knew that I wanted to perform and twirl at the college level! Now I have little girls looking up to me and I feel so honored to represent my university and baton twirling. I have been twirling since the age of two and competing since age three. I have been fortunate enough to be coached by my mother Terri Dominick and Terri Young. I am a former Miss Majorette of America and Grand National Twirling champion, as well as a three-time USA NBTA world team member, and US twirling ambassador to Peru! During my years of competing I have also been lucky enough to be a part of The Modernettes, as well as Crescendo dance twirl team! On top of attending class and band practice everyday, I practice at the gym a minimum of two hours a day to make sure all of my routines and tricks are set and ready. The night before the game I pack my bags and run through a checklist several times to make sure not to forget anything! Being prepared makes Game Day much easier and allows me to enjoy all of the festivities and traditions that go with college football! What advice do you want to share with younger twirlers considering twirling in college? Take advantage of every possible opportunity no matter what. Four years will fly by before you know it! Make sure you are smiling and looking happy during performances and game day! You never know where and when a picture of you may end up one day! What is your favorite trick to do on the field? Illusion front walkover catch into a one-handed from walkover! During band camp this year, our band field was turned into a beach! The constant rain during camp caused the band field to become extremely muddy and slippery. So to prevent injuries and to repair the field the university put sand down! Needless to say I leave band now with tons of sand in my shoes! My favorite memory twirling so far would be when Ole Miss beat Alabama last year. On top of meeting Katy Perry at the game, and ending up on ESPN. I had the opportunity to perform with the pep band in our tailgate area called The Grove while College Game Day was on the air. A couple of days after the game, I was contacted by a photographer, asking if it was okay if he published a picture he had taken of me. I found out later that day at practice the photographer was from The New York Times. He had photographed me while I was performing in The Grove with the Pep Band. Thank you for everything you do to promote marching bands across the country and Go Rebels!